The island could also become a crucial provider of renewable-power-to-gas for Europe. 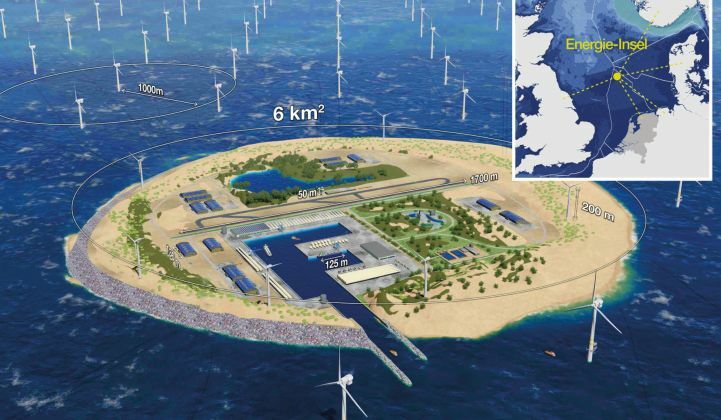 A group of European countries is looking to build a giant island in the North Sea in order to support up to 100 gigawatts of offshore wind projects. If built, the island would be sited on the Dogger Bank, a large North Sea sandbank where the water depth ranges from 15 to 36 meters. It is intended to act as a staging post for turbine operations and maintenance crews, as well as to provide a central connection for planned far-shore wind farms and host direct current lines acting as interconnectors between Denmark, Germany, Holland, Norway and the U.K.
“The cooperation will spend the coming years investigating feasibility and develop a model before deciding whether to go forward,” said Jesper Nørskov Rasmussen, press officer at Energinet.dk, the Danish transmission system operator (TSO). Energinet.dk was due this month to become the first commercial partner in a venture -- unveiled in June 2016 by Dutch TSO TenneT -- to build an island serving between 70 and 100 gigawatts of offshore wind capacity, along with island-based solar generation. Also involved in the agreement is TenneT’s German subsidiary, which manages transmission infrastructure from the north coast down to the southeast border of Germany. The proposed North Sea Wind Power Hub is seen as “an important next step towards accomplishing…the 2050 climate goals formulated in the Paris Agreement (COP21),” wrote TenneT in a press release this month. Rasmussen said the total cost of the island, including electrical installations, had not been calculated. Just building the base, from sand and rocks, would cost an estimated €1.5 billion ($1.6 billion), he said. TenneT and Energinet.dk claim the project will help deliver economies of scale for far-shore wind farms, and yield efficiencies by allowing direct current lines to double as interconnectors. Staff, components and assembly workshops could all be stationed on the island to simplify offshore logistics. The North Sea Wind Power Hub would also boast an airport. Given the vicinity of large wind turbines, “security regarding landing [and] takeoff is...one of the things that has to be looked carefully into,” Rasmussen said. Figures from the European industry body WindEurope show 96.4 percent of all offshore wind capacity installed in 2016 took place in the North Sea. The total capacity installed in the region topped 1.5 gigawatts, according to WindEurope’s latest statistical report. Cumulatively, the North Sea accounts for 72 percent of all offshore wind installed in Europe. On that basis, the North Sea Wind Power Hub makes a lot of sense. But many other energy islands have been proposed -- and then canceled. In 2013, for example, the Belgian government proposed building a donut-shaped island in the North Sea to act as an offshore pumped hydro store for excess wind power. This idea appears to have been passed over by the North Sea Wind Power Hub designers at TenneT. And in 2008, inventor Dominic Michaelis proposed using floating islands to develop ocean thermal energy conversion generation, as well as harnessing power from wind, solar, waves and sea currents. Similar concepts have also been proposed for China, but to date the Asian giant has not even been able to successfully build out onshore eco-city plans. Furthermore, it is not clear whether the U.K., a potentially major partner in the scheme, will support the North Sea Wind Power Hub, in light of its recent confirmation that it will start the process of leaving the European Union this month.